It is understood that reusable bags are safer on the environment, but once you decide to make the switch to reusable bags your decisions do not end there. Reusable shopping bags are definitely better for the environment than disposable plastic bags, but not all reusable bags are the same. Bags constructed from bamboo offer an unparalleled level of sustainability and eco-friendliness. Bamboo is an evergreen plant that is part of the grass family, and it is pretty much the definition of sustainable. It can take up to 70 years for a tree to reach maturity, whereas some species of bamboo can grow as much 39″ in a single day. Some shoots have even been observed to grow 2″ in one hour. Bamboo grows extremely well in poor soil and as the plants grow they infuse the soil with nutrients. Oftentimes bamboo will be planted to rehabilitate degraded soil, allowing for future crops to thrive in the same area. Shoots can be harvested for up to 3 years and a pole of bamboo can regenerate in as little as 6 months. Since the plant grows so quickly it is a renewable resource that can easily keep up with the demand of today’s consumer culture. Thanks in part to a vast root system bamboo can continue to sprout new shoots, making it a very invasive plant. Home gardeners find that if not managed bamboo can overtake a garden rather quickly. Harvesting is good for bamboo because it prevents the plant from becoming overgrown and unmanageable. In addition to growing quickly bamboo consumes a very high rate of carbon dioxide and turns out a high rate of oxygen. All plants absorb carbon dioxide and release oxygen, but bamboo does so in a much more efficient manner than other plants, and it converts dangerous greenhouse gases in our atmosphere into breathable air the process. Since bamboo is natural it is also biodegradable. The plant can break down in a safe and efficient way, meaning that once it is no longer needed it will not take up space in a landfill or need to go through a recycling process in order to be re-manufactured back into something useful. Bamboo will safely break down without causing harm to animals or habitats. Bamboo is also incredibly versatile. There are several varieties and each variety has different applications; bamboo can be used for construction, flooring, textiles, paper, and even food. With so many uses bamboo is quickly gaining a reputation as a miracle plant that can be used for just about anything. In its natural environment bamboo does not require pesticides, herbicides, or irrigation, making it easy to grow. Bamboo is also antimicrobial in its natural state. This means it inhibits, or prevents the growth of microorganisms, like bacteria or fungus. This is good news for farmers who grow bamboo since there are no pests or bacteria that pose harm to bamboo, like there are for other plants that can be used to create textiles, such as cotton. There is debate as to whether bamboo retains its antimicrobial properties in textile form. The FDA feels that there has been no conclusive research to support the claim that bamboo is antimicrobial when woven into fabric. At the same time the FDA has not produced any evidence contrary to this claim either. There has been a lot of independent research that indicates bamboo cloth is in fact antimicrobial. This makes bamboo a phenomenal material for reusable grocery bags. Just by the nature of their function grocery bags will be exposed to germs and bacteria in the form of leaky milk jugs or dripping packages of meat or unwashed fruits and vegetables. All reusable bags should be washed regardless of the material, so even if bamboo is antimicrobial you still want to wash your bamboo bags since that is the best defense against bacteria and illness. While the jury is still out on the antimicrobial properties of bamboo bags just knowing that they may give you and your family an additional level of protection against germs and bacteria offers peace of mind. The FTC also has issues with bamboo. 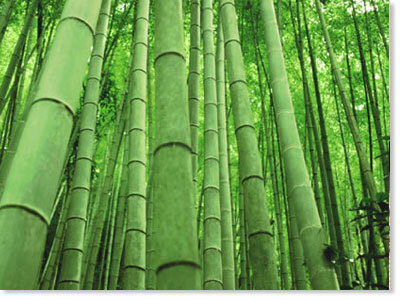 Some types of bamboo material are constructed from processed plant cellulose made into rayon. Rayon can Bamboo fabric retains moisture and breaths at the same time. This ability makes bamboo shopping bags very handy. If leaking or damp items are packed in a bamboo bag the bag will contain the moisture and protect the interior of your vehicle from the mess, but at the same time produce is not stifled and can get air. Bamboo is a very strong material and strength is definitely a desirable trait in shopping bags. All reusable shopping bags are sturdy and good for the environment. Just by eliminating the need for disposable plastic bags automatically makes any type of reusable bag a positive change. What takes bamboo to the next level of eco-consciousness is that it is a renewable resource that is biodegradable.be processed from any form of plant cellulose, not just bamboo. The FTC takes issue with rayon made from bamboo being labeled solely as being made from bamboo. Since this is misleading the FTC has mandated that textiles be properly labeled either as rayon made with bamboo or being made completely from bamboo. Retted bamboo cloth is made exclusively from bamboo in a natural process that commonly uses water to break apart the fibers from the cellular tissues. Retting is more eco-friendly than the process used to make rayon and it allows the fibers to retain a more natural look. Bamboo is full of dualities that make it a versatile and unique plant. The crop can be used for just about anything and no matter what it is used for it brings a host of benefits that gives it an edge over other materials. For more, check out our list of 10 amazing bamboo facts.